It is amazing how many of our current problems come down to the realization that it's the network, the connectivity, that matters. In most situations we know how to fix and enhance the nodes in the network. 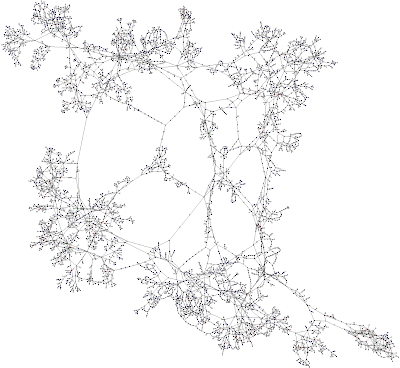 The links, and their patterns and structure, are the hard problem. How do you weave a better network, regardless of what is being distributed -- knowledge or electricity? We are making progress in alternative energy production, but we still fail at energy distribution. Windmills and solar energy collectors have made great progress -- we just can't get the energy from where the wind blows and the sun shines to where the great population centers are. To do that requires a well-designed power distribution grid. Many critics of the current grid describe it as "third world" in design, quality and capability. Today's New York Times describes the power distribution problem well. Above is a network map of a portion of the US electric grid. Life is great if you live in one of the densely connected clusters using electricity generated nearby. Things start to get real complicated if energy needs to transferred from one cluster to another cluster in grid. Distance destroys. Electricity does not flow like information or water or oil. It is not easy to direct, and much electricity is lost to heat when transferred over long distances. On the internet, 100 packets sent from Cleveland all arrive in New York wholly intact -- not so with a 100 MW of electricity generated in Cleveland and sold to NY. Even more electricity would be lost going to Miami, and forget about LA. It makes no sense to transfer electricity made in Cleveland to Los Angeles -- most of it would be lost during the trip. Not only does physics get in the way, so do local interests. Then you have another power problem -- that of political power. Doing a social network analysis of the electric grid quickly points out key nodes and links that are highly between transfer points on the grid. They become gatekeepers/bottlenecks and either extract a toll for the transfer, or refuse transfer and require the buyer and seller to find a longer route to get from point of generation to point of consumption. And remember -- distance destroys. Energy independence will take a lot more than just new technology at the point of generation. It will take the design of a much smarter network of distribution. On the other hand, just like we are learning about food production/distribution -- produce & buy local -- we may need to apply that rule to electrcity also. In preparing for ArbCamp, whose theme this year is "publishing", I found myself just yesterday thinking about the distribution networks for print publishing: newspapers, academic journals, books and bookstores, and social media. And, of course, the centuries-old social network underlying it in some of the world.